When the hills are plastered in snow a well stiffened 4-season boot is ideal to make mountain walking safe and secure, so here’s five of the best. No boot is worth having if it doesn’t fit properly. The inside of the boot should be around 13-15mm longer than your foot. You can gauge this by putting the boot on, without the laces tightened up, and then placing your forefinger down the inside of the boot at the heel. Better outdoor stores will measure your feet for a precise fit. The upper should be snug and comfortable across the foot too. If you want your boots to last as long as possible, look for uppers with minimal stitching and a rubber rand that fully encloses the whole boot. Durable designs are most important for those regularly heading out onto rockier ground and ice-covered mountains, but it’s not so important if you walk less often in the hills, or tend to stick to paths or level terrain. The ankle cuff helps prevent mud and grit from entering the boot. It also protects the ankle against being scraped on rocks. The stiffness in the ankle cuff reduces the strain on the ankle when traversing slopes and while scrambling by adding extra support. But on easier ground, smooth paths and level ground, such support is less important. Some walkers also prefer the freedom and easier ankle movement of boots with lower or softer ankle cuffs. while a 3-season boot will be very bendy, and a 3-4 season boot will be somewhere between these extremes. Deep, wide-spaced lugs will bite into soft mud and snow without clogging, while also providing many years of wear before they are too shallow to give a good grip on soft ground. A heel breast between the forefoot lugs and heel of the sole adds valuable braking power on descents. 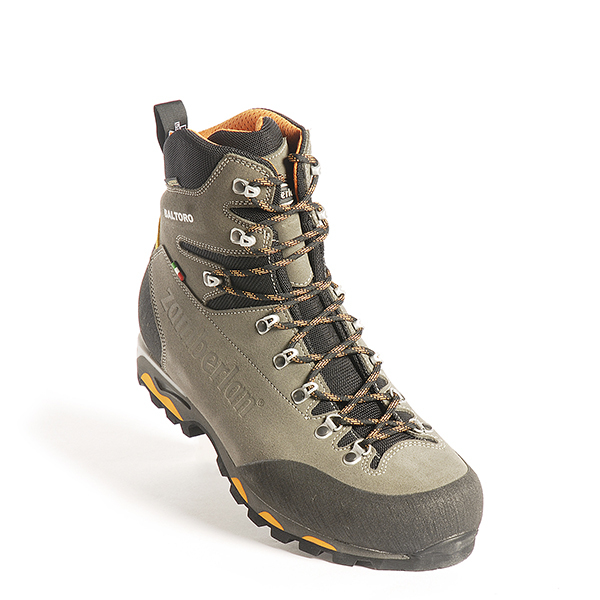 Not all boots are designed to be used with crampons due to the stiffness of the sole and flexibility of the upper. Crampons are not generally recommended for 3-season boots, but flexible crampons rated as C1 can be fitted to 3-4 season boots, while stiffer crampons rated as C2 can be fitted to 4-season boots. This well-priced boot is built around a suede leather upper, with Schoeller soft shell materials around the ankle cuff. There is not too much stitching or overlays of material, so durability is good and you also get a full rubber rand. There is Gore-Tex inside for waterproofness. The very aggressive Vibram outsole has deep, well-spaced lugs and a deep heel breast, which is ideal for crunching through snow and keeping a grip. The fit is great, with a slightly narrow toe which helps with scrambling over rock. The ankle cuff is very comfortable and allows a gentle flex forward, while the outsole rolls smoothly from heel to toe. Walking below the snowline is good for this category of boot. This boot holds the foot slightly higher above the ground than some, which means that when walking over rocky ground or when scrambling you feel slightly less stable. But this is a tiny difference and will only impact those wanting the absolute best performance on tricky ground. I’m always cautious about recommending synthetic materials for hard environments, as they’re rarely as durable as quality leather or a plain rubber rand, but again this will only impact the hardest of users. For pure mountaineering others are very slightly better if you want the best and can afford it. But most hillwalkers will find this ideal for their needs and any benefits from others are small. A great boot at this price for general winter hillwalking, with some benefits available if you pay more. Zamberlan’s 1000 Baltoro competes well with other boots, particularly as the price is more tolerable than some and it’s also relatively low in weight. The upper is made from Hydrobloc Perwanger leather, with Cordura nylon around the tongue and the ankle cuff. Inside the boot there is a Gore-Tex waterproof lining. I like that there’s not too much stitching, and for even more durability there is a rubber rand at the toe and heel. Underfoot you get a Vibram sole unit with widely-spaced lugs and a heel breast. Get the boot on and the toe box is spacious, and the upper is quite stiff and supportive, so the result is a great boot for general hillwalking. While this feels good on the foot, it does not feel quite as neat and precise as some. Also the ankle cuff is not quite as well padded as others and doesn’t flex quite so smoothly forward when walking, so this area in general is just a little less comfortable than higher-priced boots. The sole unit is good but the outsole lugs are not quite as deep as others, so on snow without crampons the boot does not crunch into the surface and grip as well as others. If you want a boot for scrambling then those with a slightly narrower toe are better, as they offer more precise foot placement. There is no women’s option either. For its price tag this boot is ideal for most hillwalkers who don’t need the best performance but do want to save some cash. Slightly more expensive boots offer extra benefits though. The Vibram Curcuma sole unit of this boot sets it apart from many others, and makes it ideal for winter use thanks to its deep and widely-spaced lugs. The sole has great stiffness too, and a good heel breast. Working from the ground upwards you get a full rubber rand for durability and an upper made from synthetic fabric with suede leather overlays. The tongue and flexpoint of the ankle cuff are made of softer synthetic materials. Get it on and this boot feels great on the foot, with a fit that is neither too narrow nor too wide. The ankle cuff is supportive and ideal for general use. When walking below the snowline the sole rolls nicely. It’s a pretty lightweight boot too. While the overall performance and general comfort is great, what lets this boot down is that there is no women’s option, although at least the unisex size range does go down to a 5, which may be sufficient. Like other synthetic boots, it probably won’t be quite as durable as a leather boot without stitching, although only really hard users need to worry about that. If you do lots of scrambling or mountaineering you’ll notice that others allow for slightly more precise footwork. Some also offer more comfort around the ankle cuff for a little more cash, while for those with an eye on the budget other boots carry a lighter price tag. A relatively lightweight boot with great performance for general winter walking, but regular scramblers or mountaineers will find others offer even better features. The first unusual feature of this boot is that the top of the ankle cuff gets an elasticated gaiter to help block debris from entering the boot. The ankle cuff itself is high and supportive, but it also flexes forward comfortably to allow easy walking. A double tongue design extends from the ankle cuff down the boot to add more cushioning and breathability. The upper is made from leather with synthetic materials, while a Gore-Tex waterproof lining keeps feet dry, and a full rubber rand provides more durability. The outsole is a Meindl Vibram Alpin 3 unit with a great set of deep, well-spaced lugs for grip on snow. Get it on and it instantly feels spacious and comfortable, and generally great for mountain walks on snow. While this boot feels spacious and comfortable, it doesn’t feel quite as precise on the foot as others, which is slightly more noticeable when scrambling over rocks or mountaineering rather than walking. It is not the lightest boot either, and so when that is combined with its slightly less precise feel it just feels a little clumpier than some others when scrambling. These are tiny drawbacks though and not really that apparent when just walking. The main drawback is that this boot has a higher price tag than others, so you have to really value the extra comfort and spacious fit you’re paying for. This very comfy and spacious mountain walking boot is ideal in many ways, but isn’t the best if you want a more precise feel for climbing over rocks. The Manta Pro defines the 4-season mountain walking boot category, and while it remains unchanged it is still the best option if you can stretch your budget. Built around a leather upper with synthetic overlays and Gore-Tex waterproofness, the upper is supportive, with extra durability coming from a full rubber rand. The ankle cuff is slightly more comfortable than other boots. It provides great support and also flexes forward particularly smoothly for comfortable walking. The outsole is a Vibram unit with deep, well-spaced lugs and a good heel breast, and it also rolls reasonably well from heel to toe when walking. A nice benefit is that the forefoot and toe areas are slightly wider than others, but still afford a precise feel for scrambling over rocks. 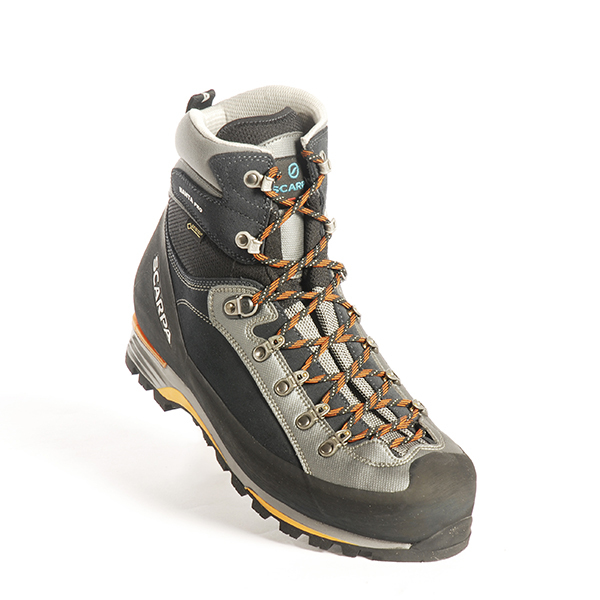 If you need a boot mainly for mountaineering then a more dedicated design would be better, owing to those boots having a narrower toe and therefore an even more precise feel. It would be nice if this was a little lighter, but on the foot it actually feels lighter than some other boots that do weigh less, and this is due to the careful design that works so well with the foot. A boot with fewer overlays might be more durable for those of you that really hammer your kit. But the main drawback is the price, so if you aren’t a regular winter walker then a lower-priced boot will no doubt suffice. Sets the standard for regular walks and scrambles over British mountains in winter, but others have benefits for climbers or less regular hillgoers.